You will not encounter too many difficulties while biking on the national roads/country roads of Guilin. The most challenging thing is the traffic. The traffic condition is not good on popular roads (Guilin to Yangshuo, Guilin to Longshen, etc.). Biking on those parts is a risky and makes people unhappy. The high-speed trains now connect Yangshuo and many other cities in China, with the train station located at Xingping town. The national road between Guilin and Yangshuo is on rebuilding, which are likely to cause a jammed traffic on the traditional bike route (Guilin-Daxu-Xitang-Xingping-Yangshuo), with low satisfactions when biking. In mountainous areas of in Guilin, cyclists may experience cycling uphill and downhill after a 10KM-40KM riding away from the city area. Rough roads are quite common in Guilin; therefore a skilled speed changing is needed. Each climbs lasts dozens of meters to a few kilometers. 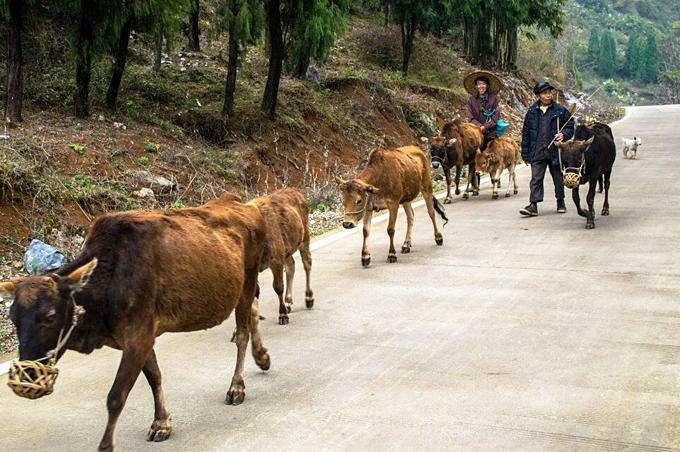 There are many slopes lasting over 20KM in Guilin in the rural villages and wild areas among the mountains. However, we will not put them into the itinerary, as it is too difficult for less-experienced riders. To learn the proper usage of gear shifting bikes, please read this page. Dirt roads, roughly paved country roads, macadam, farm tracks, broken cement roads/ asphalt roads, together with other perfect conditioned roads can be found when cycling in rural areas of Guilin. The city is less suitable for road bikes (only small section of the road around Guilin enjoys a good condition), but perfectly fits mountain bicycles. However, even a well gear shifting folding bicycles without suspension forks can finish most of the biking routes in Guilin. Guests may feel more comfortable when using the proper equipment. The highest mountain around Guilin is only about 2200meters (the Mao’er mountain of Xing’an county). If you are biking around Yangshuo and Guilin, the average elevation on the road is only around 200-400 meters, with most of the slopes being only less than 1km. The highest mountain in Guilin city is the Yaoshan Mountain, an 8.5KM climbing with a rising elevation of about 450meters (close to CAT2 level of the tour of France). 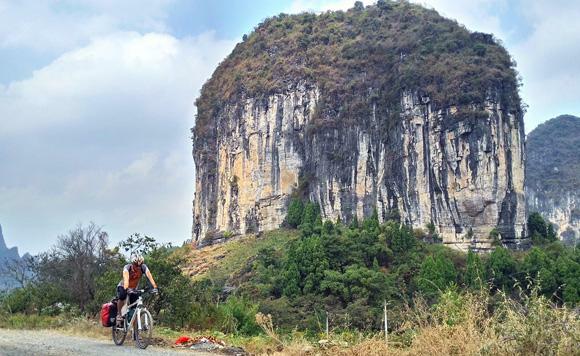 The most difficult areas for a bicycle trip around the grand Guilin are the eastern part, the northwest/northeast mountain areas (The countries of Longsheng, Ziyuan, Linggui, etc). Cycling about 80km per day around Guilin is a good idea for skilled riders. It is recommended to do some cycling exercise in the month immediately before your tour. Some moderate amount of training will reduce saddle soreness and leg fatigue, and bring you greater enjoyment during the tour.